The 2018 edition of Badwater 135 saw 62-year-old Pamela Chapman-Markle win yet again in her age category for women. She finished the 135 mile-race (217.26 kilometers) in 34 hours, 30 minutes and 53 seconds, ending up in nineteenth position overall. Pamela was 19 years old when she survived cervical cancer. A nurse-anesthetist by profession, she hadn’t run any race till the age of 55. Seven years later, the US based-runner is at the top of the list as regards women over 60 running ultramarathons. Her accomplishments include breaking the course record for women in her age category at Badwater 135, three years in a row. The Rocky Raccoon 100 is a 100 mile-trail race held at Huntsville State Park in Texas. This was Pamela Chapman-Markle’s first race, which she finished in 28:45 hours despite a stress fracture of the tibia, severe hyponatremia and freezing temperature. Immediately, she started looking for another race to run. Her preference was for runs exceeding the length of a full marathon. Thirty races later, over half of them 100 miles or longer, the results amaze. She has participated in Keys 100 five times so far and has emerged winner in her age category all the five times. The event is an annual ultramarathon in Florida; the Florida Keys being a coral cay archipelago located off the southern coast of Florida. They form the southernmost portion of continental United States. `Key’ is derived from the Spanish word: cayo meaning a small island. Brazil 135 is the brainchild of runner, Mario Lacerda. According to published reports, it was first run in early 2006. Ten years later, of the 50 runners from all over the world admitted to the 2016 edition of Brazil 135, Pamela finished fifteenth overall with a time of 43:41. 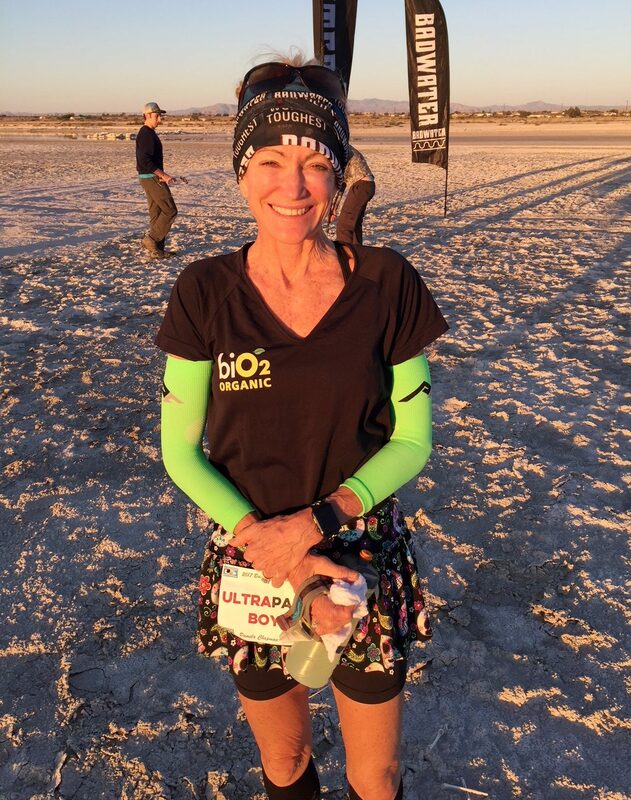 She then improved her time at Rocky Raccoon to an age course record of 26:56 and followed it up breaking the Badwater 135 record for women over 60 by three hours. 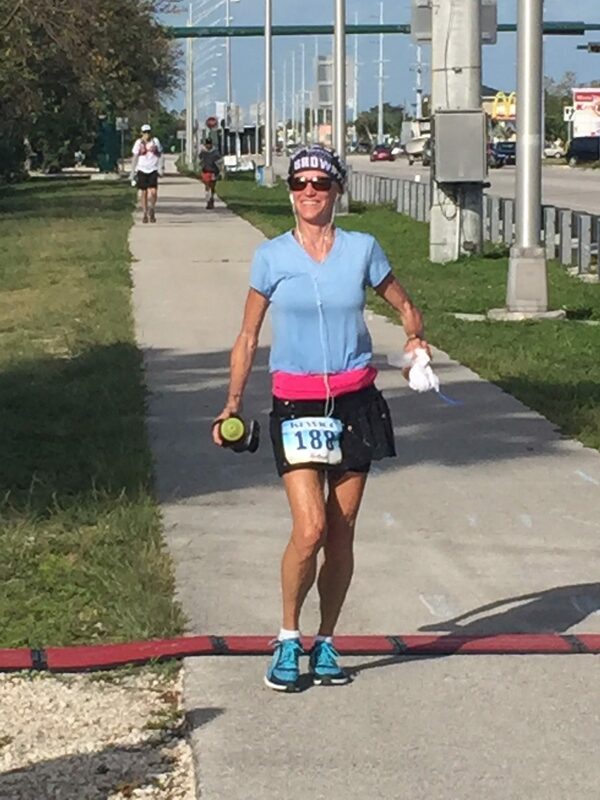 After turning 61, Pamela achieved a personal best for 100 miles at the Daytona 100, with a time of 21:29. Although pacers are allowed at many races, particularly for her age group, Pamela has run nearly every race without pacers for company. Her husband Spencer Markle, a non-runner, is all there is for support crew. The string of success she had in 2016 was the turning point of Pamela’s running career. In 2017, she qualified for Leadville 100 at the Austin Rattler. Then, she broke her own age course record at Badwater 135 by over five hours and achieved a podium finish as the third overall woman finisher. This was despite Pamela being the oldest female runner in the race. In October she broke the age course record at Arkansas Traveler 100 by over two hours and followed that up lowering her own personal best with finish of 21:07 at Daytona 100. The latter was over 20 minutes faster than the all-time USA record for 100 miles by a female over 60. However it had happened at a course that was not certified by USA Track & Field (USATF), the national governing body for track and field, cross country running, road running and race-walking. Pamela and her husband, Spencer, realized that she had the opportunity to become the fastest woman ultra-runner over 60 years of age in US history. They selected USATF certified courses so that any record broken would be official. They set their eyes on the records for the 12-hour, 24-hour, 100k and 100-mile distances. The first to fall was the 24-hour record of 106.4 miles. Pamela took that to 109.17 miles. This happened over the New Year (2017-2018) at the Across the Years race in Glendale, Arizona. Then she broke her own age course record in the 51-mile Badwater Cape Fear beach run finishing it in 9:49. In early April she finished fortieth overall out of 266 runners who started the Umstead 100 in North Carolina, completing it in 23:58. 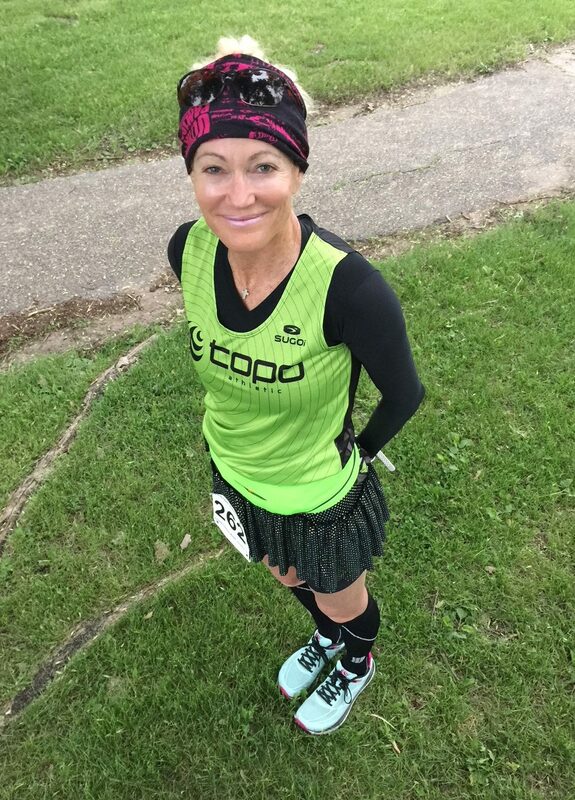 In the first week of June, she traveled to Minneapolis, Minnesota to run in the Fans Ultra Races. There she set a new 12 hour-record for women over 60, logging 65.2 miles. In July, 2018; Pamela ran the Badwater 135 ultra for the third year in a row. She broke the course record for women over 60, with her time of 34:30. She ended up in nineteenth position out of 99 runners. She was the oldest woman running the race. At the time of writing, the three fastest times ever by a woman over 60 at Badwater 135, stood in Pamela’s name. She set a course record in 2016; then broke that record by over five hours in 2017 and in 2018, bettered that again by over an hour. A nurse-anesthetist with over 35 years of experience, Pamela typically handles 10-15 surgical cases every day at the Texas Medical Center, Houston, before turning her attention to running. What prompted you to get into running and why did you opt for a 100 miler instead of going through the usual route of opting for smaller distances initially? What did you find so engaging about the ultramarathon? I love running by myself. It gives me mental peace allowing me to get in touch, spiritually. 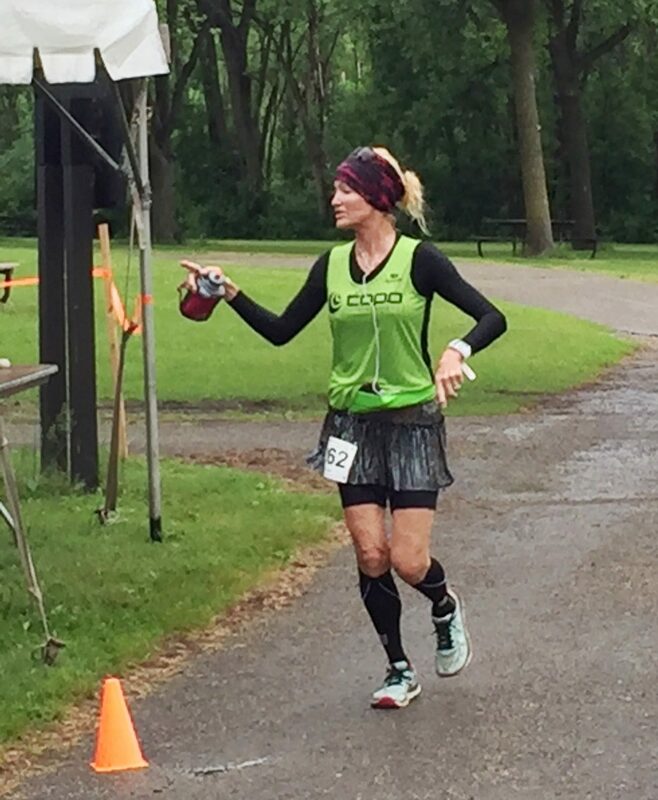 I decided to run an ultramarathon at age 55. I went to sign up for the 50 mile and it was full so I decided to run the 100 mile. It was my first race. I had never run a race before. It was supposed to be a one-time, “bucket list”. After I finished this race, I learnt a lot and knew I could do it faster and more efficiently. I was hooked to 100 mile races or larger miles. Were you interested in sports in your school / college years? Were you involved in any fitness related activities in the run-up to your first Rocky Raccoon 100? Yes, I have always been interested in sports. I was a cheerleader in high school, worked out on my own in college and used to teach high impact aerobics, step, and stretch for a club for over 12 years, at least five classes a week after my regular job. Do you have memories of how the first Rocky Raccoon 100 unfolded for you? Will you please share it? Did you face any problems on the course given it was your first race and a 100 miler to boot? I had many problems in Rocky Raccoon 100 starting with hydration, food, and clothes. It was the coldest ever in Texas that day and the temperature was 30 degrees. I did not dress appropriately for this weather. I suffered a stress fracture in my right tibia 87 miles into the race. So I actually hobbled the additional 13 miles to the finish line. I also trained 34 miles a week, all of which was a huge mistake! Of all the races that you have participated in which is your personal favourite? Which was the most challenging? My personal favourite is Badwater 135. I have to say it is the most challenging also because of the extreme heat. Older people into running – particularly those beginning to run at an older age – are wary of injuries. Your own first run – the Rocky Raccoon 100 – saw you tackle a stress fracture of the tibia. What has been your experience with injuries? How do you keep them at bay; how do you address them when they occur? I feel I am stronger health wise since I have become an ultra-runner. My bone density is great, my VO2 max has improved. It has made me more careful with trail runs because my vision at night is not that good. I slow down and pick up my feet! What, according to you, has been the decisive factor or factors that have helped you attempt these ultra-long distance foot races? Did you ever find yourself disadvantaged because you were a late starter in running, taking the plunge only at age 55? Do you think it may have worked to your advantage given it was a brand new world opening up in middle age? The decisive factor that helped me attempt my runs has been this – I feel if I believe I can do it, then I can direct my body through mind control to do it. The disadvantage of being an older athlete is that Americans are clueless on how much more one has to work to compete. I love the people I have met from all over the world and they are so excited at the older athlete’s progress. I feel fortunate to be able to be where I am at this stage of my life. If I was younger, I might be faster. But then my heart might not be in it like it is now. I want ageing athletes to accomplish whatever they desire and not take a back seat just because we are getting older. Can you throw light on your training program? What are the key elements of your training that you believe helped you to not only attempt races one after the other but also set course records for your age category? I train about 75-100 miles a week. Most of my runs are slow. I work full time so I am tired but still run. I feel this has helped me greatly because I don’t go home and lie down on the couch. I eat only grass fed animals and organic fruits and vegetables. I am a low carbohydrate athlete. What do you focus on in your diet and nutrition? I have to get more protein, running as much as I do. I focus on organic foods and drug-free protein. Your husband, Spencer, is your support crew. He is a non-runner. Can you describe how the journey into running ultramarathons has been, for both of you as a couple? Was the idea of you launching into a 100 miler at 55 years of age, easy to accept for the two of you? Seven years later, what do you make of this journey with one person running and the other, crewing? I ran my first ultramarathon (Rocky Raccoon) before I met Spencer. I was training for my second ultra (Keys 100) and he offered to crew me! He is my biggest supporter. He always sees more potential in me than I see in myself. He knows what I need, and when to help me. He has not missed any since then. I am glad he is not a runner! He works out and rides a bike on my long runs but running is not his sport. Apart from Brazil, which are the other destinations outside of the US you have traveled to, to run races? I loved Brazil! I have not traveled out of the US but intend to soon. I am going to slow down my work schedule at the end of this year and increase my traveling around the world. Going forward, what are your plans as ultra-runner? Media reports have mentioned your continued attachment to Badwater 135. Can you explain the reasons for that fascination and how long would you like to keep returning to Badwater? Do you feel similarly attached to any other race? I am attached to Badwater 135! Reasons for that are – the race is well run, the people are family, the desert is different every year I run it! I am treated as an equal athlete regardless of age. I will keep returning to Badwater until I am 70! I love several of the races I have done. I am off to, Leadville in Colorado next week and look forward to that race. I would love to go out of the US and explore the world on foot. Second on my most fun races would probably be the, Keys 100. It’s hot, humid and an eye full of ocean!